There are two types of tax values that are on the minds of farmers: market value (the value per acre for highest and best potential use) and current agricultural use value. Farmers who farm more than 10 acres and participate in the Current Agricultural Use Value (CAUV) program typically benefit from lower tax bills because tax is calculated based on below true market values. The program began in 1973 with the intention of leveling the playing field for farmers by computing farmland values based on crop yield, soil conditions, interest rates, and crop prices that have proven to be volatile. Projections just released by agricultural economists in the College of Food, Agricultural, and Environmental Sciences (CFAES) forecast that agricultural land is expected to see a decline of around 11.2% from 2017 values that averaged around $1,153. The projected average 2018 CAUV value is expected to be $1,023 per acre for the 24 counties in Ohio receiving either reappraisals or adjustments to their properties’ assessed value. Ani Katchova, Associate Professor and Farm Income Enhancement Chair, and Robert Dinterman, Postdoctoral Researcher in the Department of Agricultural, Environmental, and Development Economics are releasing their projected CAUV values months before the Ohio Department of Taxation will release the official CAUV values. They say the reduction will help farmers lower their expenses and help stabilize declining farm incomes. He furthers that CAUV values are anticipated to be even lower in the future, because we still have the phase in process and the CAUV formula is based on seven-year averages of several inputs. 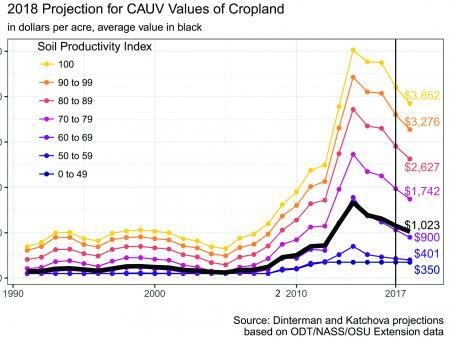 CAUV has undergone significant changes to its formula in the past few years – mostly by changing its formula for the capitalization rate – which impacts the OSU agricultural economists’ projections for the 2018 CAUV values. To calculate the projected values, Dinterman and Katchova used official Ohio Department of Taxation and USDA data, and data on non-land costs. The Ohio State agricultural economists anticipate that the decline in CAUV values for 2018 will be a continued trend for at least the next 3 years. Even though the average value of CAUV is expected to decline by 11.2%, not all soil types will decline by the same percent. Katchova and Dinterman caution that their projections are not the official Ohio Department of Taxation estimates. They claim it is possible for the average CAUV value to decline by as much as 20.6% while it is also possible for the average CAUV value to rise by over 20.6%. However, an increase is viewed as unlikely. Dinterman, R., and A.L. Katchova, “Ohio CAUV Value Projections for 2018.” Report, Department of Agricultural, Environmental Economics, The Ohio State University, February 2018. Farm Science Review Discussion on Ohio CAUV.